After working in this industry for decades, we've come to believe that most industrial enclosure applications should be treated as a custom project. Many sales reps, engineers, project managers and facility managers hesitate to do that because they think the “c” word (custom) means high price, long lead-time, and a big hassle. That's understandable, but it’s not necessarily true when it comes to equipment enclosures. It's actually completely economical to customize a wide range of features. Click here to find out how much our enclosures cost. Dimensions are fully customizable, along with aesthetic details like color. Custom penetrations can be easily incorporated for existing piping. Climate control can be built in for most environments. We could go on since we build custom enclosures for water tanks and pump systems all the time. Instead, we'd rather show you yet another of our recent custom shelters. Safe-T-Cover engineers were recently called upon to design a custom equipment shelter to replace and aging wood and sheet metal structure. An aluminum enclosure was ideal because they last indefinitely and require no upkeep. This custom shelter needed to be 120" x 168" x 72" so that it would fit perfectly on top of the concrete block wall foundation of the previous box. Our engineers worked closely with the customer to design an equipment shelter to meet all the specific requirements of the applicaiton. This customer requested accessibility on one side of the enclosure for routine maintenance and equipment replacement. Fortunately, our modular panel design allows for much greater access than the design of the previous cover. The enclosure included removable access panels for their convenience. 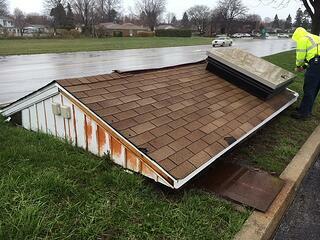 Additionally, the custom enclosure will be mounted to the CMU foundation wall of the original shelter. Get your own custom enclosure built to your exact specifications. As always, our engineering staff spent as much time as the customer needed working on the designs for the project to make sure all their specific requirements were met. It is a myth that custom aluminum enclosures mean long lead time and it only took three weeks from sign off to delivery. The equipment shelter was packed in a large box with all the hardware necessary for assembly as well as detailed assembly instructions. It starts with a call or email to one of our in house engineers who have worked on hundreds of custom enclosures. With the use of our extensive catalog of design details, we can quickly alter one to meet your exact specifications. Alternatively, we can create an entirely new design if necessary. Safe-T-Cover can provide a quote within half a day, and drawings and specifications within a full day. 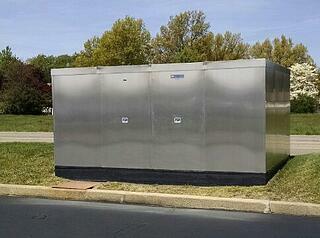 Our modular design makes it possible to provide an industrial enclosure in almost any size with a variety of options. Our custom aluminum enclosures are built to provide long term protection to your precious equipment. Remember, if it's worth protecting, it's worth protecting properly.